The Castillo Outdoor Pendant is made for use as general or ambient hanging lighting in outdoor settings. It’s well equipped to handle the elements of your outdoor setting, as it is UL listed for wet locations, it features all rustproof materials and has all waterproof switches. 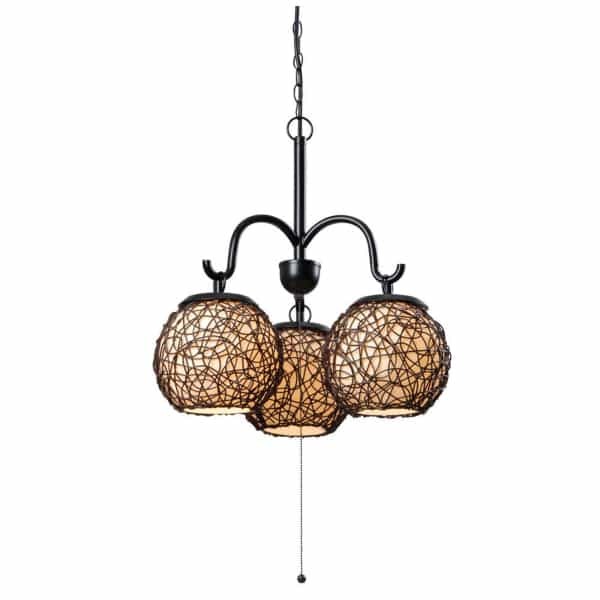 Aesthetically, the Castillo Outdoor Pendant features three white glowing balls of light that are wrapped in a rattan encasing. The design hangs from bronze base with curving, reaching arms and turns on and off with the use of a pull switch. Adding a general lighting feature to your outdoor space, whether it’s a dining area or deep seating area, adds a whole new element of functionality to your area. You can read outdoors, even when the lighting is not perfect, dine outside long after the setting sun, and entertain with romantic evenings comfortably after dusk. Consider bringing the Castillo Outdoor Pendant in to light up your space with one pull of the switch.